Daily Theme Day - Numbers! 1780, originally uploaded by jahansell. By the way, the reason this is in black and white except for the flag is that I originally posted it on the fourth of July in 2006 - and wanted to highlight the flag. Today is Theme Day in the City Photo family -- 181 blogs have signed up to participate. 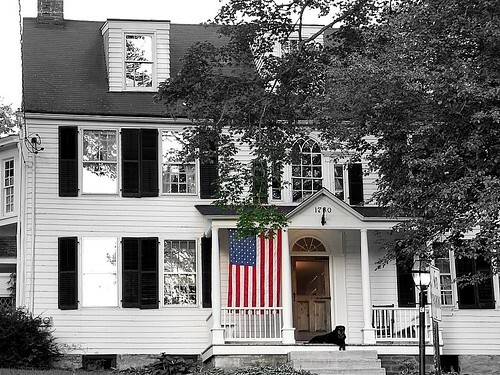 Beautiful home and I like how you did the b&w and the flag in color! 1780 - and in very good condition! The way they number houses in the States 1780 could have been a house number. One of the clerks at a hospital in Palm Springs we had the misfortune to visit couldn't comprehend we could have a house number with just two digits. What a beautiful place, lovely photograph and super choice for today. 1780? That house is 200 over years old and still looks so good? wow! Great photo - I love what you did with the flag. I can see myself getting confused with the address and the year built on the front of the house! Beautiful house. As the others have said, its in beautiful condition for its age. Jenny, Sharon is quite an historical town. In Pacific Grove, California they hold a Victorian house tour each year, featuring different beauties of the period with the year built always noted as in your photo. But, out here in the west only a few Spanish missions and Russian settlements feature such old dates! We must make Europeans smile at our youth ;^). Those squared off dormers are unusual. Makes me wonder where the gables went? And I think the place where the date is fixed is called the portico when it stands alone without a porch. I don't know what it is in combination. I love the dog on the porch! That must make it one of the oldest houses in the US - I wonder how many times the wood ha been replaced? I like the pooch on the porch too. The only buildings we have in California that are older than that are a few of the Spanish missions. What a great house! Confusing to have both house created and address displayed, but makes perfect sense if you're a local. The original Starbucks coffee store at Pike Place Market has it's 1912 address above it's door and that is often assumed by many people to be the date the store started. In response to Kim's comment, the reason there are no dormers on the third floor windows is that, in the 70's, a fire ravaged the attic of the house, and the entire floor had to be rebuilt. Thank you all for your comments. To provide a bit more information, that's Abigail in the photo: Abby to those who knew her. She was a half-rottweiler, half-golden retriever who truly believed that the entire Green was her queendom. She passed last Christmas at thirteen years of age. The photo catches her at her happiest: perched on her throne, watching over the town.